Pentatone is combining two of its best-selling recordings, 'Franz Schubert: Complete Works for Violin and Piano' volumes one and two, into a double Super Audio-CD set. 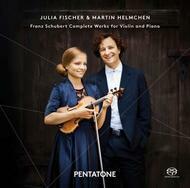 The recordings by these two brilliant German artists, Julia Fischer and Martin Helmchen - which were originally launched in 2009 (Vol.1) and 2010 (Vol.2) - were remarkably successful from both a critical and a commercial standpoint. As it is the violin and piano works that constitute the essential enchantment, one can hardly imagine that somebody would be interested in one disc without wanting the other as well. These performances, which were charmingly recorded in a warm acoustic space, form perfectly balanced conversations between two vibrant young personalities. As Pentatone once again collaborated with its trusted partner Polyhymnia International recording studio, with its outstanding reputation for the quality of its multi-channel surround sound recordings, it goes without saying that this album will be a delight to music aficionados� ears.